Finally, I've caught up with The Bonnie Wee One's photo album. This collage is of her ninth month, and since she hasn't completed her tenth month yet, I can let it go for awhile and turn my attention to other things. These pages are taking me a long time. I spend longer on hers than I have on the general family photo album, too long really. Come year two when Smudge's rapid changes do slow down somewhat, I must really make an effort to be more rigorous with my choices and keep it to one or at the most two collages per month — or perhaps even longer sometimes. Having said that, there are other tasks at which I am far far behind. I have meant to print out some of my blogs for posterity. I don't why: just because we want to leave something behind, I guess. I was doing this in an html sort of way, but it was a chore, so I shelved the chore for awhile. I didn't realize just for how long, however, until I just checked where I stopped printing. Would you believe in the autumn of '05? Good grief: that one got away from me. Didn't it? So off I go to catch up on that little task. ... has been spending a lot of time at our house this as Mom does a bit of helping out at work. Thesha's been on maternity leave since last April but will have to go back in a few short months. But it's busy there now, and she's lending a helping hand for a few days. So, we've had the pleasure of the little one's company, and it's gone very well. This picture was taken after yours truly helped to feed her. I previously made mention of The Pillars of the Earth. It is set around life and fictional characters in twelfth century England, and it's a very absorbing read if you like historical fiction and quite probably even if that isn't your usual genre of choice. It's quite simply a fine story. But this isn't meant to be a review. No, it's about hygiene. The part that I was last reading revealed that women typically bathed only once a month. I leave the timing of said ablutions to your clever little imaginations. But the men! Twice a year! Only twice! The occasions that prompted such leave-taking of their senses escape me now, but I surely remember the number. One wonders how they could live with themselves and each other. And how would you like to cuddle intimately with someone who hadn't bathed for a half year? I guess sensibilities were different for, judging by the fact that we're all here now, they managed the up close and personal stuff quite well indeed. I'm sure we're all rather glad they did overcome the odour because we'd be nowhere without those antecedents. Literally. But I also wonder if we don't overdo it these days when daily showers are the norm. I was brought up in different times when bath night occurred on Saturday. Period. In fact, in order to save a few pennies, my family didn't even turn the hot water on until sometime on that day. It was an electric water heater in the apartment that I remember most. There was a switch on the wall that got flicked on come Saturday, and we all took our baths. At least we all ran clean, fresh water for each bath. I think. I trust. Aside: of course, I'd shower after gym class, and I imagine that my parents heated water in a kettle and took sink baths. We take showers for granted and as a necessity now, but when we were young Cuppa and I would often stay in a cottage sans running water. We discovered that you could attend to personal hygiene quite well from a small basin. Of course it all changed in my teenage years. Teenagers do become fastidious and body conscious after all. We had moved and whether because of my age or changing family finances we now kept the hot water tank on the ready. But even then, although I bathed at home, I only showered at school. For one thing the bath in that cottage was just that — a bath and only a bath. And it really wouldn't have helped had we had a shower head because the water pressure was abysmal enough to have made showering an impossibility or near enough. It was just a trickle — literally. With time and patience we could draw enough water for a bath of sorts but it would have be nigh unto impossible to have been able to shower had the place been so equipped. Showering daily is the norm for many people nowadays: for some twice daily. Have we gone a bit overboard? Does the typical person working in a typical office really gather a ton of dirt or sweat on a winter's day? I know that the heat of summer increases the need tremendously, but I really have to wonder about the necessity of daily showers. Still ... I much prefer today's concept of cleanliness and hygiene over what have been a perpetual human stink back them. In the blog before this, I just mentioned waking up rather early this morning. I also mentioned that lately I have been experiencing restless hours from about 3:00 to 5:00 AM. This is a new wrinkle in my sleep, or should I say sleep-less odyssey. My traditional pattern, at times when I have been going through sleep problems, is to find it difficult to drop off to sleep. Once there, I have usually been fine. Not lately though. This morning there was a new and added wrinkle just before 5:00. I was already sleeping lightly, so I quickly picked up the sound of our cat, Rocky, in pre-barf mode. One hears an ominous sort of choking and retching, and one just knows that a gooey and icky hairball is about to hit the carpet. In our somnolent states, we have never made it to the beast in time to prevent this carpet-splat. No, we always a little late for the event ... but just in time to clean up the subsequent mess. There have been a few upchucks in the past few weeks. He goes through spells. He'll have a quiet few weeks, and then he'll have a week or two of more frequent hairball-elimination. This morning, however, I was awake enough to jump into action quickly. When I first came to, I discovered that he was still on our bed, so the initial action was to kick him off — firmly but not too violently. Secondly: I grabbed a nearby plastic bag and placed on the carpet below his wretched and retching little head. The good cat stayed right there over the bag and continued to retch. But never vomited! Can you believe it? The one time that I manage to act in time to save the carpet, his need passes and the heaves are just that — dry. And then I was up for the duration. Oh, I tried to get back to sleep, but further blessed repose was to elude me. After an hour of lying there and becoming increasingly wakeful, I arose, ate some cereal and put on the coffee, Normally, I can get back to sleep, even after cleaning cat puke but not this time. Perhaps it was the book that I was reading last night: Ken Follett's Pillars of the Earth. As I was reading, I could feel myself getting absorbed and wired, so I played a calming game of Sudoku and then read a bit of This is Your Brain on Music. I was on a very dry section of the book last night, and it sufficiently de-stimulated me to get to sleep. But after the cat episode, my mind went back to twelfth century England, Kingsbridge, Prior Philip, Jack Jackson and the rest. I guess that means that it's a good book, but I would have preferred not to relive it at 5:00 o'clock in the morning! Donna over at Made in Heaven has tagged me to list five things about myself. Although I've probably revealed a modest trillion or so things in this blog space over the years, let's see what my fertile brain comes up with this time. 1. It continues to surprise me that some people are afraid to retire because they're worried about finding enough to do with their time. Me? I worry about having to work again and how I would ever find the time to do the things that I want to do. Blogging comes to mind, for example. 2. I was present for the birth of our second daughter but not for the first. That was in 1972, and our small city hadn't progressed as far as letting Dads in at that point. Six years later they had, and it was a splendid experience for me. Now you can bring a crowd and a picnic lunch into the delivery room. 3. Some people generate lists easily. I don't. It's hard for me to think of things from scratch. I do much better with prodding of some sort. However, once I have a point in mind, I am tempted to say quite a lot about it. I'm being good (for me) so far today though. 4. As a late bloomer into the world of coffee, I didn't start drinking the brew until I was fifty-two years old. Then, I figured it was high time and began with to coax my palette with three creams and three sugars and eventually settled at double cream. On most days I'm content with my one morning mug (unless we pass by a Tim Hortons at some point during the day). However, I invariably follow my morning coffee with a Diet Coke. To be honest, I have to follow almost everything with a Diet Coke. 5. Although I was a geography teacher, due to financial constraints, I hardly travelled until I was in my fifties when we drove out west in our little, old Corolla. Even then, we did it the cheap way and primarily camped. It was a blast, and my travel journal was what I used for my first web page — which still exists here by the way. I appreciated the adventure so very much, that I am convinced there is really something significant to be said for delayed gratification. 6. Bonus: Sleep is getting weird again. Lately I've been going through restless hours from about three to five o'clock. Before and after than interval I have slept not too badly. But not today. I awoke at five o'clock and gave it up by six. I was tired yesterday too. I don't understand. There Donna: I've been good, but I will beg off the passing of the torch. I'll leave it up to the readers to pick up or not as they will. As you know, young parents arise from slumber when baby choses to rise, and they must often sleep when baby sleeps. One minute you're a carefree young adult able to stay up late at night and sleep in late the next day, but, in the wink of an eye, gone are the late hours, and you find yourself thankful to go to bed not too very long after baby. I clearly remember visiting Cuppa's parents in Toronto, and after some sort of family get-together, Cuppa and I tucked in the wee one, perhaps around nine or ten o'clock as she wasn't always an early-to-bed baby especially in a strange place, and Cuppa's parents' place certainly qualified as strange. Whaever. We followed the little one's suit shortly thereafter and soon trundled off to slumber land ourselves. Hours later, let's say around one o'clock in the morning, give or take, I stumbled groggily out of bed to attend to a certain bodily necessity. There were Cuppa's parents, aka Thesha's grandparents, having a whale of a time with extended family. 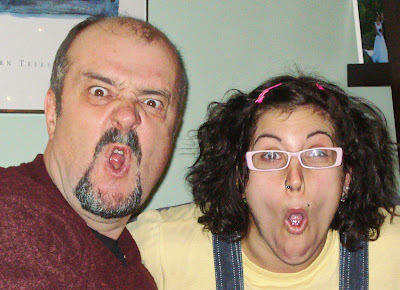 They were sitting around the kitchen table, finding many things to carry on about and laugh uproariously over. I mean, they were having a great hoot and a holler of a time. To this day, I remember (or think I remember) almost my exact words to them. I believe that I squinted up my sleep-encrusted eyes and tiredly muttered or groggily growled, "So there is life after kids?" as I shuffled wearily and resignedly past them on my way back to bed. Of course, as children are wont to do, Thesha grew up, and she became the nocturnal one. As a late teenager/young twenty something, she wouldn't even contemplate going out until ten o'clock. The hours, and I do mean hours, before her grand exit were reserved for the marathon of showering, shampooing, make-upping, and hair-fixing. Saturday evening, not altogether for the first time, the shoe was on the other foot. Thesha stayed home to tend to the wee one and get a decent night's sleep while Cuppa and I went out to hear a local group at a nearby pub. Somewhat in commemoration of the younger Thesha, I even did the shower and make-ready bit in the hours prior to departure. It was a tame impression of Thesha at her best, but I did what I could. The gig didn't begin until nine o'clock, and we were there ... and Thesha wasn't. It's her turn to stay home with the youngun, just as it is our turn to be more footloose once again. I'm tempted to say that the circle has spun around, but that's not exactly true because a circle implies that you come back to the same spot. And we haven't. Of course, we're not in the same place as we were more than three decades ago. How could we be? It's impossible on so many levels, but for one thing, we don't have the same energy-level as we used to. And while we find it nice enough to get out and party (if party is the right word, and I'm unsure that it is), we don't experience the same exhilaration, the same rush of excitement. It's not really a circle, more like a spiral. A downward spiral might I add. No, I'm not attempting to be gloomy. Just realistic. If there's a circle of life it's that the pattern repeats itself generation after generation but not really within one individual's lifetime. As young adults, we stay up late and socialize avidly. Then we enter the tied-down years after which we experience a second round of freedom. Although it's the same in a sense, it's very different too. For one thing it's more of a trial than a joy to push yourself to stay out until after the witching hour. So, it's official. It's Monday morning, and I'm in a downward spiral. Sheesh! I think I'll go back to bed. This is not a meme, but I suppose it could become one. I bought unmentionables this week. Six pairs (I guess they're pairs because they have two legways). I'm sure you were just dying to hear about my unmentionables. Admit it. Actually, I mention my unmentionables because the topic does tend to reveal some of my quirkiness. For one thing, I buy six pairs at a time. Basically, it's out with the old and in with the new. Mind you, it was well past time to out the old. Shoulda done it months ago ... unless I wanted to join the clergy and be as holey as possible. I will possibly hang onto a pair or two of the less-holey specimens in case of a laundry emergency, but for the most part I'm done wif em. I do the same with socks: buy six pair and discard most of the rest. It's a quirk. I suppose I feel certain sense of orderliness by doing it this way ... or something akin to orderliness, perhaps. I dunno, it just seems right. But that's not all. I carefully rotate said garments. Actually, that's not true. I don't do it all that carefully (I'm not that obsessive doncha know? ), but if x pair come back from the wash while y pair are still in the drawer, I usually make sure to pick up the y pair and place the x pair underneath. That way, they'll be likely to wear at something approximating the same rate. Again, I'm not sure what this says about me, and I almost cringe to ponder what dear readers might be thinking right now. But I simply am driven to wonder and ask if anyone else is possessed by a similar habit. You could comment or better still run with the idea in your very own up and personal blog space. Let me know one way or t'other. Will ya? I post, below, another composite of The Wee Bonny Smudge just to make a point. You see sometimes I drive myself crazy. You see, that collage represents the lost fifth month. What I had previously been calling her fifth month was really her sixth ... and so on. Can someone please tell me how someone who can and does make these composites not be able to count to five? Careless errors. They are my bane. I still remember taking a math test in high school, you know where they start you out with easy questions like 52= ? It's a gimme and the answer is 25. I knew that but wrote 10 because I carelessly said to myself 5x2 rather that 5x5. Grrr. These days, I check a recipe, list the ingredients, go shopping for said ingredients, and upon returning home almost invariably find that I neglected to list something. Recently, I plumbed new depths when I forgot to list manicotti from a manicotti recipe. Oh, I got the garlic, chicken, cream cheese, parmesan and what have you, but I came home sans lasagna. It's at times like that that I'm afraid abuse the Queen's English and wish to dislocate my very own jaw with my very own fist. I could go on and on. I have been playing Sudoku on my new Nintendo DS. I truly get the logic and can do an almost-intermediate puzzle in about 20 minutes. That's not a record, I know, but I'm just saying ... However, on most efforts the &*^% machine usually clocks me at 40 to 60 minutes because it penalizes me 20 minutes for every careless error that I make on the way. I'll see that a 2 must go in this box, but I will have a brain cramp and put it in the adjacent slot, or I'll enter a 4 rather than a 2 or whatever. It drives me crazy, I tell ya. I drive me crazy. But at the age of 60 I know it's not going to get better. In fact it's going to get nurse (oops, careless error — I meant to say worse). In 1995 Cuppa and I took a little holiday trip to Eastern Ontario and Ottawa, and onto Montreal. When we were in Ottawa, we had the great pleasure of spending an enjoyable evening with Marcia and Robin. It was the first time that we had visited with them in more than fifteen years. In fact, we had lost contact with them for quite a while. Marcia and I had taught across the hall from each other for several years back in the seventies, and we all became friends: me, Marcia, Cuppa and her husband, Robin. But we eventually lost contact after Maria and Robin made several long distance moves. It was my fault really; I wasn't a very faithful keeper-upper and letter-writer back then. But I had heard that they were living in Ottawa, and when I knew that we'd be visiting the city, I was keen to renew acquaintances. Somehow, I found Robin's email address, and we've kept in fairly close contact ever since. But about a year and a half after the girls moved here, Robin sought medical help for back pain and was diagnosed with pancreatic cancer. What a shock! Robin was an athletic and fit man who in his early fifties looked and moved like a much younger fellow. He tried valiantly to beat it and stay with Marcia and his three teenagers, but lost the war only about six months later, early in 2000. When I received Marcia's initial email, I was in shock and wrote a brief reply expressing my concern, but I didn't want to intrude much into this trial of theirs. However, Cuppa, with her different personality, took it upon herself to write longer and frequent supportive letters to Marcia, who received them ever so gratefully. Because of the stress she was under, Marcia's replies were generally on the brief side, but she found Cuppa's letters to be very uplifting and appreciated them greatly. Cuppa kept these letters on file and has recently begun to post them on Blogger in Letters to Marcia. I knew that she was planning to do this but didn't realize how far she had gotten until I checked in this morning. She already has eleven posts online, but before she gets too far with this and it becomes onerous to catch up, I thought you might like to get in on the whole series. It begins here with a Letter to Marcia on September 09, 1999. I think you'll find it well worth your while to follow along. The truth is that I am years behind in organizing my photo albums, so I'm trying to at least get the little grand up to date in the next few days. She just turned nine months old on the weekend, but these are from her sixth month. Cute little dickens, eh? That's this morning's work. Now to vacuum, lunch, fiddle and shop in something approximating that order. Phew! Cuppa and went out for a walk today. With temperatures hovering around 0°F, it took a wee bit of self-talk, but we managed to haul ourselves out by the scruffs of our own necks. I knew that I would feel better for it, but it I still had to work up my determination. Of course, it did feel good to get out and take the air as they say. When you bundle up enough, you can actually stay pretty warm. In point of fact, except for my face, I was probably warmer outside than I had been inside, for Cuppa and I tend to keep the house on the coolish side in winter: about 65°F during the day and 60°F at night. 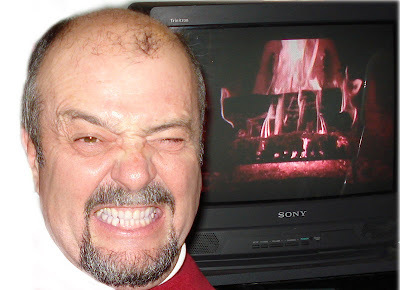 I find that wearing a sweat shirt over top keeps me comfy enough during the day, and I have seldom been cold at night. In fact, the opposite is often the case. The other night, I was so hot that I actually got up in the middle of the night to check if the heat hadn't been turned up. It hadn't, so it was just one of my internal switches that had been thrown on. Anyway, back to the walk — briefly because I am losing track of what I thought I wanted to say when I began. Getting outside in winter can be invigorating. We can and do distract ourselves with indoor activities, but physically moving one's body about on a winter day can be ... well I don't know what exactly. Exhilarating and invigorating (although I used it above) aren't exactly the right words. They're too strong, but I think you understand what I'm driving at even though my thoughts aren't coming together tonight. What with both of us experiencing ankle problems recently, Cuppa and I haven't done well with walkies this winter, but perhaps we'll be able improve our record over the next few months. One has to take advantage of whatever the local environment offers, for if Canadians waited for the warm weather to get out and move about, we'd all turn into butterballs. After laying blogging aside for seven months, Cuppa recommenced posting over a week ago and has been amazingly faithful ever since. Ironically, however, the formerly faithful AC seemed to stop just about the time Cuppa got back in the game. I haven't posted for more than a week, and that last post was simply a random video clip. Sometimes there are things that I almost feel compelled to write, and I felt that way for awhile and was posting quite regularly. At other times, my attention wanders off in other directions. I guess I've been guilty of that a bit lately. For one thing, I resumed linedancing after a seven month hiatus, and I also picked up the fiddle again after a week of rest for my aching fingers. 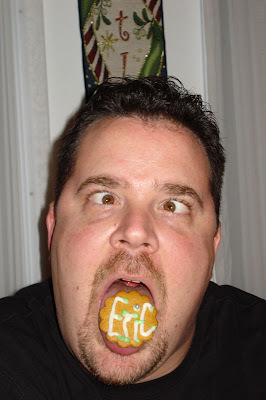 And, wonder of wonders, I have also been motivated to cast my eye to my old website. Once upon a time, I had some journals that I wanted to post online. Well, actually I had a paper journal of our road trip out west in 2000, and I decided that I could use it as a means to learning a bit about making web pages and web sites. I put that journal (I called it Westward Ho — original I know) up on the space the my ISP afforded me. But after our next trip in 2001, the space that my ISP allowed me was insufficient to add Eastward Aye. That's when I purchased my own domain, anvilcloud.net. When Thesha got married , I added Gettin Hitched. I have used anvilcloud.net now and then since but not very much, mostly to post homework for online courses. So, it's pretty well been sitting idle for most of the past few years. I mean to say, when I discovered that I could blog on Blogger and post countless photos on Flickr, I didn't seem to need my own website, and my use of it declined. But I hated to give it up, and it has nagged me enough lately that I decided to at least update the home page. 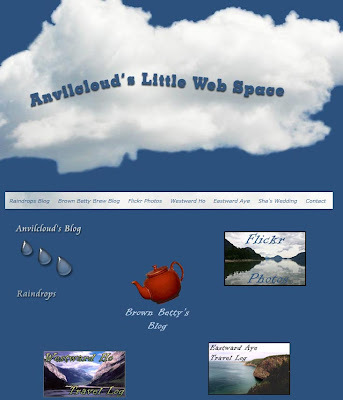 In the use it or lose it reality of life, I have lost most of my html skills, but I was able to revive enough knowledge to design a new entry page for anvilcloud.net. That's a screen capture of most of it below. I was able to implement my ideas fairly well, but they didn't turn out as appealingly as I had hoped, but at least it's a change from the old home page. I don't know whether I will add more to the site or not. Perhaps I will host my own blog there someday, rather than on Blogger. Who knows? Anyway, those are some of the things that have taken my attention lately and my rationale for abandoning you for the time being. Found on Google Video: city traffic somewhere in India. Regarding my previous baby pictures post, many of you noticed a similarity between Thesha and Smudge. Ginnie went on to ask if they are similar. Yes in cuteness and pleasant disposition but definitely not in terms if activity level. Definitely not! No way! 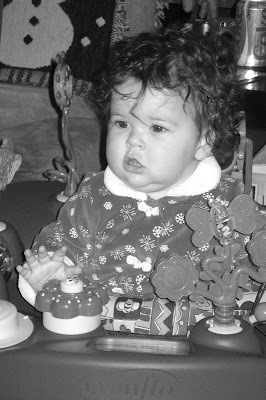 Thesha was a sedate baby. Plop her down, and she'd quietly amuse herself. I remember taking her out with us to visit with several other couples one Sunday night after church. We were the only couple who brought a child. Thesha sat quietly on the floor and continued to amuse herself as the clock hands rolled around a few times. The hostess remarked that she had never seen a baby like that. Neither have I come to think of it. Smudge is the exact opposite. Her feet hardly ever stop moving and her head constantly swivels back and forth. She's forever twisting and turning and reaching and grabbing. Frankly, I've never seen anything like her before either. Althegal was much more active than Thesha but not to this degree. I guess Smudge is already lagging behind in the crawling department. She's in her eighth month and pushing nine, but doesn't seem likely to crawl soon. Part of the reason may be because she's too busy rolling this way and that. She can get pretty well anywhere she wishes by rolling. We had thought that Smudge's activity level must come from Dad because he seems like the type who would have been a going concern. But his mother claims that isn't the case, that he wasn't all that active as a baby. Headline news: Cuppa has just posted her first blog in seven months. Hopefully, many more posts will follow. I love how she thinks and writes, and I know that those who recall her do too. Over the months I have received many notes inquiring about Cuppa, asking if and when she might blog again. Well, lo and behold, she has. 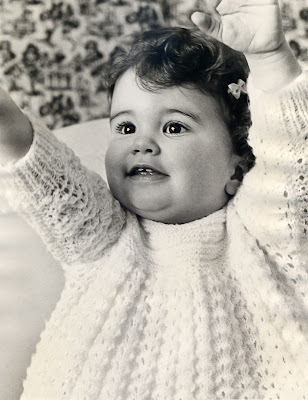 As for the picture, it's of my own little baby more than three decades past. Thesha had a print and asked if I could restore it a bit and make another copy. I did some repairs and touch-ups, and think it came out well. I took the original over three decades ago, lo these many years, and enlarged it myself. I didn't have a very good situation for doing my own developing and enlarging, so I didn't stick with it for long, but I'm glad that I was able to practise a few darkroom basics while the opportunity existed. At the time digital cameras and Photoshop were beyond, well beyond, most people's comprehension. In fact, it was to be about another two decades before they came on the market, and I certainly had no clue whatsoever back in the early to mid-seventies about where technology was headed. Back then, I had yet to see my first pocket calculator and computers were huge and only read punch cards. I do remember when my school got its first digital camera much, much later. It only captured a 640x480 pixel image, but I was blown away. As is plain to see, Thesha was one heckuva cute baby then as is her Smudge now (below). Every now and then, I catch a glimpse of Smudge, usually in profile, that reminds me very much of her mother, but for the greater part she favours Dad. The two photos in this post don't reveal much resemblance between mother and daughter, but I thought that I might as well go ahead post an old-fashioned style black & white of The Bonny Wee Smudge to go with the one above. This drives me nuts. I went to bed around 11:00 PM. Although that's earlier than usual, I didn't even feel perky enough to read. My eyes felt sore, and I just wanted to close them and sleep. Check the time of this post and you'll know how well that plan worked. I've snacked, played Sudoku, checked blogs, and even reviewed a few old linedances — I want to get back to linedancing soon after a six month absence — and here I am three hours later complaining to you. Thanks for listening. In my last post, I made passing reference to the comings and goings in Blogland. That's the main reason why I don't keep a blogroll posted on this site. It became too irksome for me to try to keep it up to date. I do, however, have my own hidden blogroll, and if you have commented a few times, at least semi recently, you're on it. Back in the summer, however, I made the decision to make some people on my roll inactive. In other words, if they visited, I would return the favour but I wouldn't see them on my regular rounds (which I do make quite faithfully even if I don't always do well at commenting). Of course, it came to pass that almost none of this particular group of bloggers ever came by again. I guess they also only paid return visits, and when I stopped, they stopped. That strikes me as a bit odd, because with very few exceptions, they first came to me. My unwritten rule is that if a new visitor comments, I will try to return the favour. If someone comments a few times, then I add her/him to my list and then proceed to refresh their blogs on a regular basis. Life changes, frighteningly fast sometimes. In contrast to this group of bloggers who are still active but not with me, there is a whole other group of other bloggers out there to whom I have have kept and will keep links, even though they seldom write or comment any more. They are the ones who I'm pretty sure would or will still drop by if or when they decide to become active participants one again. I miss these folk: Cathy, Eric, Mimico Dale, Colorado Dale, Dave, PBS, Mapcap, Val and so on (yes, I could probably go on). As the wheel turns, however, there have been new relationships forged in the past year or so: Ginnie, Pearl, KGMom, Pam, Lorna, Donna, Philip. Chris, Ruth, Chani and no doubt a few others who escape my senile recollections at the moment. 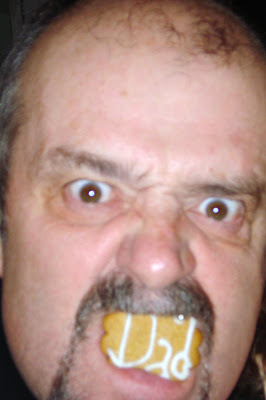 I am glad for your presence, however long this relationship may endure, just as I am glad for the shorter list of those who have maintained this blogging endeavour for a long time: people such a Gina, Granny, Lynn, Karla, Colleen, EC etc (and some of these are beginning to wane). By golly Colleen, you have been stalwart! There's no real point to this post: no denunciation, no rancor. I'm simply reflecting on the multitude of comings and goings, which we're all free to do. There may come a point when we all decide to move on. I have come close to that several times when keeping it all up seemed to be a drag, times when I wondered what to write but felt that I should do so in order to keep the blog somewhat current for those who might click in. It all seems to become a bit chore-like at times like that, but there are other times, when I am anxious and even fairly bursting to record my tiny thoughts. Some of my recent posts such as Onstage, A Touch of Redemption, and possibly The Good Neighbour fall into that category. In some of these posts, I feel that part of what I do is to leave a bit of a record for my children. I wasn't exactly vaccinated with a gramophone needle (thanks for that phrase, Mom) and don't pass on that much to them orally, but there may come a time when they might want to know what old Dad thought about life. Here, every now and then at least, I leave some small clues for them. My mother was a talker, and I appreciate many of her anecdotes about family and what life was like for her, Dad, and my grandparents. But I forget too and sometimes wish that she had written it down. She did keep photo albums and write notes in them, and for that I am very grateful, but I wish there was even more. Saturday night find found Cuppa, Thesha, and AC (that's me) driving almost an hour through a snowstorm out to the tiny hamlet of Maberly. The weather was bad enough that Cuppa was all for turning back, but either my stupidity or doggedness (take your pick) prevailed, and we finally reached our destination. The occasion was to be my participation in my first instrumental concert ever. It took me over sixty years but not sixty-one years to make it onstage. Those who have hung around this blog for awhile (and my goodness haven't there been great comings and goings in blogland?) will know that I, in what may have been a fit of dementia, began fiddle lessons just over a year ago. Then, this past September, I joined (sort of joined) the Blue Skies Community Fiddle Orchestra way out in Maberly (no, not Mayberry, Andy). When I add the phrase sort of to joined (above) I mean that I and three other beginners were rehearsed separately in a prep group. We learned the same repertoire as the others but not all of it and at a slower pace. 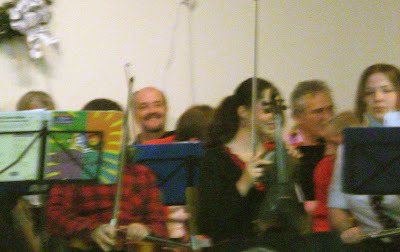 Although I did more sitting than playing, I joined in on five pieces while two others that I knew (to some degree at least) were shelved at the last minute due to time constraints. I managed to play two of the five, Schottis fran Gelda (part of which is in the clip below) and Silent Night (where I even played harmony) fairly well. However, in all honesty I must confess to making some errors in the other pieces. If you have played the very short video clip, you've quickly come to understand that we are a very amateurish ensemble. You know it, the audience knew it, and we players know and knew it. But we had fun; I think everyone did. There was a kind of joy and exuberance, and isn't that a large part of what music is supposed to be? I think that fun and fellowship were perhaps the chief function of music for a long time in our history. People would come together, play together, and celebrate together. Unfortunately, this aspect is something that has been lost to some degree in modern times as song has largely evolved into performance art. As most of you well know by now, I like good music and fine performances too, but there's also something to be said for honest, participatory music. To some extent this whole fiddling venture that I'm on feels like I am reclaiming something of my heritage. I can picture them, my forebears, back in England and Ireland participating either directly or as listeners in some sort of amateurish musical get together. And a small part of me feels that I am joining with them in a similar kind of melody. I do understand that I'll never be any good by any objective measurement, for even if I had the talent, which I don't, it's really too late for me to develop it to any degree. But playing brings me some joy and satisfaction regardless. Cuppa and I had a day in town (i.e. city) today. Of course we had several shopping errands to attend to, but we also took in a movie and a later dinner, and I need to tell you about an incident that occurred at the theatre. Entering the complex right behind us was a somewhat older couple. The lady was pushing the gentleman in his wheelchair, and the guy was pushing a good-size oxygen tank. We held the doors open for them as they navigated their way inside, and they expressed their gratitude for this very small courtesy. We went on our separate ways, or so I thought, but I immediately encountered the same couple at the entrance to The Gents. The lady looked at me somewhat pleadingly and asked if I would mind navigating the gentleman into the loo. Actually, I was delighted, and you will soon know why. I helped the guy get his chair, himself and his tank into the large cubicle for those who require extra space. It was during this struggle that he informed me that he had been normal up until two years ago. I'm not sure what I said to that, but I'm fairly certain that it must have been something completely inane. Before he locked himself in, however, I seemed to surprise him by declaring that I would wait to help him back out when he was done. The exercise did take him awhile, long enough that his wife came to the door the door to call after him. I stuck my head out and assured her that everything was under control and that I would assist him when he was ready. Well, I did just that, and they were both extremely thankful. But not nearly as thankful as I. For it must have been slightly more than two decades ago when I let a similar opportunity slip by. It occurred in yet another theatre. As is my unfortunate habit during movies, at some point I was forced to excuse myself to attend to ... er ... details. While ... er ... attending, a handicapped man entered in his wheelchair. Back then handicap access wasn't up to today's standards, and the poor guy had a mighty struggle to get himself situated into a normal-size cubicle. What did AC do to help to his fellow man? Absolutely nothing! It wasn't so much that I was being callous as that I was caught off guard and couldn't quite seem to fathom the proper course of action. Bathrooms do tend to be somewhat private places after all. However, I have felt badly for my dithering inaction for lo these twenty-plus years. And that's why I was almost ecstatic to be gifted with this opportunity. The universe gave me another chance to do the right thing, and this time I was up to the task. It felt a little bit redemptive to tell you the truth. No ... actually it felt a lot redemptive. In fact, I feel wonderfully blessed! The movie? Believe it or not: Atonement. 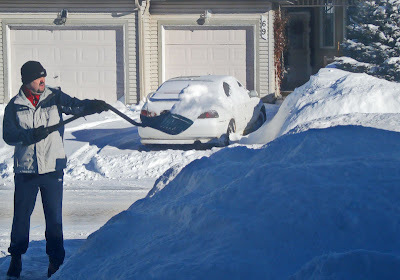 I know, ya gotta wonder how many snow and snow-shovelling related blogs I can come up with. But please bear will because it's winter here: quite a winter after the past few milder years. In case you doubt, by way of contrast I have pictures such as this one from mid-January last year which reveal almost no snow. And since I can't recall seeing an accumulation such as this since I was a boy in Montreal, surely I can be forgiven my present obsession? Anyway, this really isn't about snow per se; it's about The Good Neighbour who lives across the street. I have mentioned her more than once and already presented you with a picture, but here she is again (below). I guess you can tell by looking at her beyond-rosy cheeks that it was quite cold that day, but she still came over to blow our driveway out. She doesn't confine herself to performing this good deed to us but goes up and down the street cheerfully helping many. When someone asked her if she was making a lot of money doing this, she replied that she wasn't but that she was making a lot of friends. What a great and refreshing attitude! I wish more people had it — Good Neighbour's fantastic attitude. Of course, some do, but can't display it so obviously. For example: it was just a few years ago that I did my bit by frequently shovelling-out our neighbour's place in Sarnia and sometimes two neighbours. But these days, to keep Cuppa's worry-level at minimum, I confine myself to my own driveway. And because of Good Neighbour, I don't always even have to do that. By contrast, after our first big storm, there was another neighbour (and I use the word loosely) who plowed his lot with a plow attached to a riding lawnmower, which must make it easier than blowing, don't you think? But you know what? He just did his own place and went back inside without glancing to the right or left. I wonder how much joy he gets out of life? 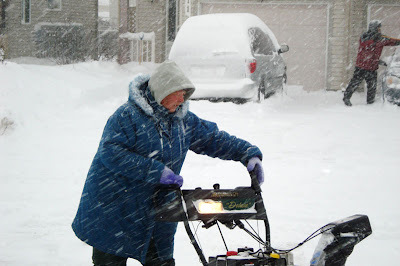 While I never expect Good Neighbour to clear my snow and while I can enjoy shovelling my own moderate amounts, I am always appreciative of her good deeds. It's not just that it saves me some labour (although there is that), but it gives me a warm feeling about my fellow humans. And I am becoming rather fond of experiencing warm feelings in the midst of a cold winter. For my special nieces and nephew in SK. New Year's Day and it's snowing out — again! I cleared the driveway this morning before heading to the kids' for brunch. When we returned three or four hours later, there was more than there had been earlier. Good Wife assumed that I would rush back outside to clear the drive off again but I haven't, for I am rather hoping that Good Neighbour with the blower will come by. She was out when we drove in, but I don' know if she still is. Whatever the answer, she hasn't done ours — yet — but I live in hope. After reading previous posts, you would be forgiven for thinking that I love and live to shovel snow. In point of fact I don't or not always anyway, but I can usually condition myself to enjoy the activity. However, I was speaking with Althegal, my younger daughter who has a degree in psychology and is working on her Masters, yesterday and she opined that I was experiencing a phenomenon known as Cognitive Dissonance. It is her opinion that my brain is tricking me (in a sense) into enjoying a repetitive, boring, and unpleasant task. Apparently, there are studies to support this kind of occurrence. While I concede that she might be correct in her assessment, I am inclined to humbly disagree. I think it's an act of will on my part. I will myself to develop an attitude that will result in me enjoying the chore as much as possible, and I try to perform said task in a way that will increase the likelihood that I will, in fact, enjoy it. I don't think that's my brain playing tricks on me but visa versa. I know that seems to be impossible — to trick my own brain because, by default, it seems pretty darn paradoxical to claim that I can use my brain to trick my brain. But I say that it's a complex organism up there above my neck and that I I have the ability to choose to use the willpower that I can muster in one part of my grey matter to affect how another part of my brain perceives the task. Maybe I'm really using my conscious brain to affect my unconscious brain, which may, in point of fact, be opposite to the occurrence Cognitive Dissonance, but I guess I should leave those ruminations to the experts. Regardless! I do rather hope that Good Neighbour will still happen by in the next hour or so because old AC is rather tired on this New Year's Day and would love recline in warmth with a good book. But I rather doubt that will be my lot and that I will quite likely be forced to psych myself up again. And I can do it, by golly.